After training as a student at Tante Marie in 1994 and working in various catering roles, she decided that her forte was in education and recipe development and came back to teach at Tante Marie in 1999. Along with the many years of teaching and demonstrating, Claire has an encyclopaedic knowledge of food, nutrition and flavours, as well as being a perfectionist food stylist. She has also attained her Certificate in Education and C&G teaching qualifications. 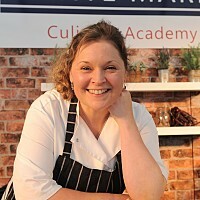 Claire’s exuberant creative flair, natural good humour and genuine enthusiasm for great food and presentation, motivates and encourages confidence in all aspiring chefs. Established in 1954, Tante Marie Culinary Academy is the oldest UK independent cooking academy, based right here in Woking. Over the last 60 years the Academy has developed an internationally acclaimed reputation for excellence, with graduates running successful businesses all around the world.